Urban estuarine habitats are vital areas for fish, birds, and other wildlife, as well as humans. These unique ecosystems protect against flooding, improve water quality, and support fisheries and tourism—connecting downtown residents and visitors with nature. Located only 3,000 yards from Capitol Hill, the Anacostia River is one of the Chesapeake Bay's most heavily altered and contaminated watersheds. Volunteers removing tires and other illegally dumped debris in a tributary of the Anacostia known as Watts Branch. Along the Anacostia River in Washington, DC, the healthy green of restored wetlands contrasts with industrial shorelines and large quantities of trash and debris in the tidal portion of the river. Located only 3,000 yards from Capitol Hill, the Anacostia River is one of the Chesapeake Bay's most heavily altered and contaminated watersheds. It contains polychlorinated biphenyls (PCBs), petroleum compounds, and heavy metals—and during almost every rainfall, untreated sewage pours from combined sewage outflows directly into the river. Only six percent of the area's original forests remain and more than 90 percent of the tidal wetlands have been lost. The Anacostia, like many other urban rivers, flows through economically impoverished and ethnic-minority areas. These areas illustrate the challenges and opportunities of restoring ecological function, aesthetics, and recreational use to highly impacted and contaminated waterways. With populations projected to increase in coastal cities, NOAA is working with stakeholders that live and use the resources and services within and along these urban estuaries. Through ongoing cooperative partnerships with the public, industry, and other parties, NOAA's Office of Response and Restoration has led a comprehensive approach involving and coordinating with programs throughout NOAA to improve the health and integrity of the Anacostia watershed. 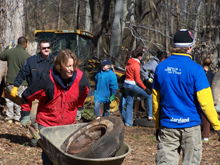 For over a decade, NOAA has worked with other federal, state, and local agencies; non-profits; and the private sector to clean up and restore the Anacostia River. 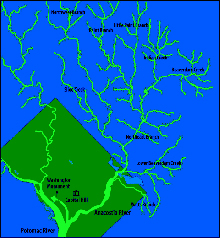 The Anacostia River watershed, shown on the right-hand side of the map above, is 176 square miles in area and covers two counties in Maryland and a portion of the east side of the District of Columbia. As a trustee of public resources, NOAA works cooperatively with the U.S. Environmental Protection Agency (EPA) and local agencies in characterizing toxic sediments in the Anacostia that have accumulated during centuries of human use. Two sites in the watershed, the Washington Navy Yard and the U.S. Department of Agriculture Beltsville Agricultural Research Center, have been placed on the National Priority List of Federal Superfund sites. NOAA is a key member of the Anacostia Watershed Toxics Alliance that collected data on hazardous waste sites and toxic sediments and made the results easily available to local communities and organizations in the watershed. Identification of these toxic "hot spots" begins a process that leads to the remediation of the contaminated areas and eventual restoration of the shoreline. Providing Online Data. NOAA is committed to empowering local organizations and communities to restore and manage their local watersheds by providing easily accessible data and information. The Anacostia River Watershed Database and Mapping Project is a publicly accessible Internet mapping Web site with both a geographic information system (GIS) component that maps contaminant, restoration, and watershed characteristic data and a fully searchable database component. This project is the result of a collaborative effort among 14 agencies and non-profits working to share their most up-to-date information. 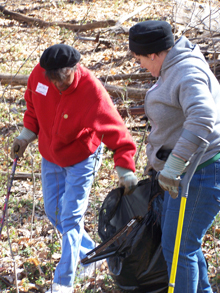 Volunteers pitch in to remove illegally dumped debris from the Anacostia watershed. The Web site is a useful tool to ensure more informed management and planning decisions, providing citizens and interest groups with the same datasets agencies are already accessing. With this tool, local communities and municipalities will be able to more effectively plan their restoration projects and clean-up activities, and residents and educators will have easy access to the information needed to keep them more informed about their watershed. Addressing Marine Debris and Building Public Stewardship. Local organizations, such as the Anacostia Watershed Society (AWS) and Alice Ferguson Foundation (AFF), are key local partners in NOAA's involvement in community-based restoration, stewardship, and education. These organizations have identified trash and other marine debris as a major problem that impairs both the ecosystem and residents' enjoyment of the river. As part of NOAA's commitment to clean up the river, the Marine Debris Program within the Office of Response and Restoration has worked with and funded these organizations to develop a trash reduction strategy that will improve the health of the river and the Chesapeake Bay. 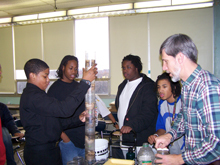 Students at Howard D. Woodson High School in Washington, DC, investigate water quality in the Anacostia as part of the NOAA Emerging Scientist Program. Enhancing Student Education. A major component of NOAA's urban estuary partnerships is enhancing environmental education. The NOAA Chesapeake Bay Office's Watershed Education and Training Program (B-WET) has funded AWS and AFF to provide students with a meaningful bay experience. Additionally, NOAA is working cooperatively with local community groups to foster restoration and stewardship in Watts Branch, one of the Anacostia's most impoverished and degraded sub-watersheds. In cooperation with the National Park Service, the EPA, the Government of the District of Columbia, and the Maryland State Highway Administration, NOAA's Office of Habitat is helping restore wetlands as part of the mitigation for the new Woodrow Wilson Bridge. 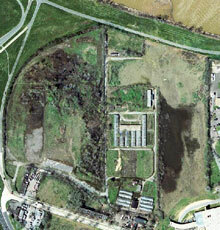 This aerial photograph shows the Poplar Point marsh restoration site. Owned by Maryland-National Capital Park and Planning Commission, this 30-acre site in Bladensburg, Maryland, was used for illegal waste disposal. Work is now underway to return the site to tidally flushing wetlands and build a public trail that residents and visitors will enjoy. This one restoration project will result in a 20-percent increase in the amount of tidal wetlands in the watershed—improving water quality and providing much-needed fish habitat for herring, perch, and striped bass. The Government of the District of Columbia also requested technical assistance from NOAA to develop clean-up and habitat restoration plans for Poplar Point, one of the few undeveloped areas on the lower Anacostia River. This restoration will increase fish habitat by daylighting (removing culverts and other structures that channel a stream underground) a local stream and will restore tidal flushing to many acres of wetlands. Additional NOAA projects with other local municipalities have removed culverts and other fish blockages to improve fish passage throughout the watershed and have provided improved recreational activities to local communities. 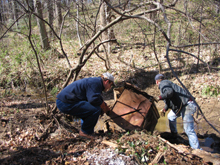 Volunteers remove a refrigerator from the Watts Branch tributary. NOAA has been a force within the Anacostia watershed for more than a decade. Different parts of NOAA have, over the years, contributed funding and expertise to help clean up, restore, and build stewardship. NOAA is currently working with several stakeholders to integrate clean-up and restoration into Anacostia waterfront revitalization efforts, in particular at Poplar Point. NOAA is also in the process of identifying several restoration projects to undertake with partners during the next five years. Finally, NOAA will continue to work with local groups to implement the Anacostia Trash Reduction Strategy and clear local rivers and streams of debris. As population pressures mount in coastal cities, threats to our urban marine resources will grow as well. By partnering with local communities, agencies, and industry, NOAA has developed relationships that are already resulting in "on-the-ground" cleanup and restoration—and these relationships will serve our resources well as NOAA continues to improve future planning, management, and restoration of natural resources.